Note: This entry does not include food nor travel. I am just a fan of a great singer about to perform in our country! You know you’re getting old when you start enjoying laid back songs more and more over hip-hop or when you would rather watch a jazz concert rather than a rap fest. Yup. It seems that I am pretty much in that stage now! But don’t get me wrong. I am not ashamed to say that I’m getting old and my preferences have changed. So, what? Great music is timeless. And that is why I am watching the upcoming concert of Patti Austin! 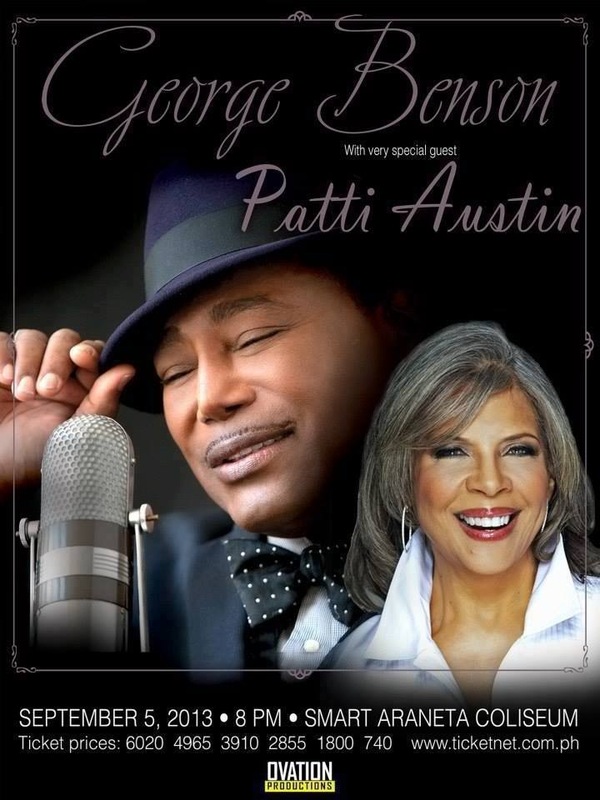 Concert organizer Ovation Productions has announced that they are bringing Grammy Award winning singer- songwriter Patti Austin with renowned 1980’s former Sergio Mendes lead vocalist Joe Pizzulo to Manila and Cebu in August 2013. Tickets are now available at all Ticketnet outlets or online at http://www.ticketnet.com.ph. Ms. Austin, the American R&B, pop and jazz artist behind such smash hits as “In My Life”, “All Behind Us Now”, “Say You Love Me” —all perennial favorites among locals — has performed in Manila many times before. She is very excited to come back to the country again and to entertain the Filipino audience. This time around, Ms. Austin will be having as front act Joe Pizzulo who sang for popular Brazilian artist Sergio Mendes as lead singer in the 1980s. He is the voice behind the hit singles “Never Gonna Let You Go”, “What Do We Mean To Each Other”, and “I’m Never Gonna Give You Up” among many others. Austin and Pizzulo will be performing at the world class Smart Araneta Coliseum in Manila on August 9 and at the Waterfront Hotel in idyllic Cebu City on August 10. The Philippines has recently enjoyed hosting a number of international performers such as Jason Mraz also promoted by Ovation, and the concert held by Ms. Austin’s fellow Hollywood Bowl Hall of Fame inductee, Steven Tyler. Mr. Tyler performed with his rock band, Aerosmith. Joe Pizzulo is best known as the lead singer for Sérgio Mendes in the 1980s. He has had numerous hit singles with Sergio Mendes such as “Never Gonna Let You Go”(from Mendes’ self-titled 1983 album). Pizzulo has had several singles and soundtrack appearances, but he is also a prominent background singer for many artists. Joe Pizzulo started his music career with a band called Roadshow in 1969 after attending Ursuline High School in Youngstown, Ohio. Later, he became a member of Brainchild. He eventually moved to California in 1974 and started a new band called White Licorice. His career quickly took off after recording “Never Gonna Let You Go” for Sérgio Mendes. 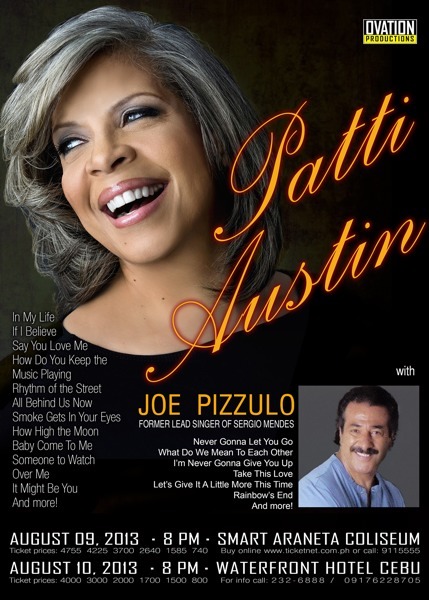 You are Here >> Home » Events » Patti Austin and Joe Pizzulo in Manila!